“Lady Godiva,” a shared bear sponsored by food eateries in the Boyertown area decorated by seniors at Boyertown’s Senior Center, is decorated with hundreds of photographs of flowers and the seniors and the staff who attend and work at the Center at Spring Street. Rouge, eye shadow, mascara, and lipstick were provided by Alice Gerhart, retired art instructor for the Boyertown School District. Alice takes pride that “Lady Godiva” is the one female bear (so far) in the pack. Ed loves kids and often paints them them in mind. 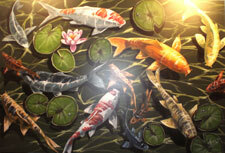 The koi mural was painted in 6 hours--start to finish. Ed, noted, "I still can't believe I did them that quickly." Ed takes you to a tropical paradise through his work! “Lady Godiva” was created by many members of Boyertown's Senior Center who worked together for many weeks cutting out and pasting the hundreds of pictures of flowers which adorn her body. If you look closely, you will find over 150 faces of Boyertown's seniors displayed on Lady Godiva as the centers of blooming sunflowers as well as the names and logos of the participating businesses. Focus on her face and you'll enjoy the artistry of Alice Gerhart, long-time art teacher for Boyertown Area School District. Alice is especially proud of Lady Godiva's eyes, but she is not just proud of the long, curled lashes or the lovely shade of blue eye shadow which compliments the rosy blush of her cheeks and her luscious red lips. Alice “built up” Lady Godiva's eyes—the oft-mentioned symbol of women's beauty—as a focal point of her face. An alluring smile adds to her beauty. “Lady Godiva is the only girl Bear Fever bear,” noted Alice. She may be right! How special! 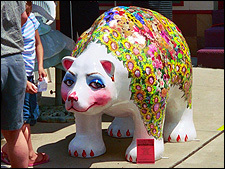 This shared bear is a great symbol of community cohesiveness evident not only through the sheer excitement of the sponsors involved and the initiative taken in having so many competitors come together but also in the decoration of this bear by many of the members of Boyertown's Senior Center. Schaeffer's Family Restaurant, Hickory Park, and Moyer's Catering—all long-time family-owned businesses—shared their enthusiasm for the Bear Fever project as a way to help the Boyertown community which they serve and have lived in for so long. 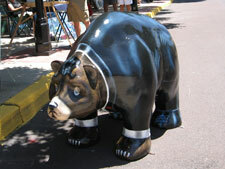 Although I was not able to secure appointments with Frecon's Orchard Outlet, Greshville Inn, Jukebox Café, and Saville's Diner, the other food establishments involved in this Bear Fever Shared Bear, each of them has demonstrated a strong desire to support their community through their involvement in Bear Fever. I'm hopeful that they will want to contribute information about themselves and their services so that we can add information about them to this website. Kindly feel free to call or e-mail Mrs. Stahl at 610-367-8066, janeEstahl@aol.com to set up an appointment. Bear Fever aims to be inclusive and responsive to the community in all aspects of the project. 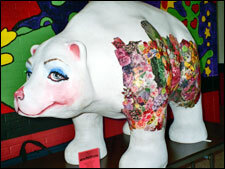 Sadly, Bear Fever's Food Shared Bear “Lady Godiva” needed a makeover. In her second life “she” became a “he” and is now “The Maitre d'” positioned proudly at The Center at Spring Street symbolizing the fine food fare prepared on site by their talented chef in their state-of-the-art kitchen and offered to Boyertown's seniors on weekdays at The Center. The transformation wasn't easy or quick and required muscle and patience to sandblast the bear to remove the many layers of clearcoat, glue and paper of the bear's first life. 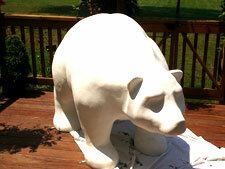 Ed Luterio, Bear Fever's most requested artist, nicknamed him “Bondo” and spent hours sanding, cleaning, and priming him. But, “The Maitre d'” is another of Ed's proud creations. Look for the special touches Ed applied: shoelaces, buttons, a handsome mustache, and blue bedroom eyes, for example. And, because so many of the finer points appear on the bear's underside, a special mounting of the bear—standing on a platform and slanted slightly—was created to allow Bear Fever fans a better look. That's Ed! 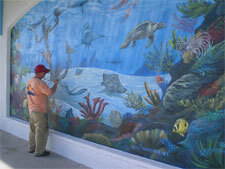 Ed shares that he's loved fish and fishing and painting fish his entire life. Every day he makes time for fishing somewhere—early in the morning or late at night—whenever he can make time for it. But…every day. He's taught his children to fish and love fishing as well, but we'd find it difficult to find the same enthusiasm and energy in anyone but Ed himself! 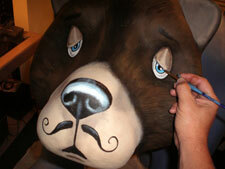 And even though his Bear Fever bears have not yet become canvases for his favorite subject, he is one of Bear Fever's most prolific artists and is always happy to paint another bear. 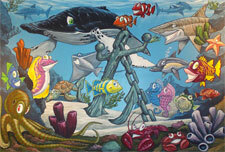 Ed's website, www.fishpainter.net displays his work as a freelance self-taught artist and illustrator specializing in wildlife and ?game fish. His favorite media include oils, acrylics, watercolor, and pencil. In addition to painting fish and Bear Fever bears, Ed enjoys doing mural work to add a very personal touch to a home of office. The mural section of his website showcases some of the work he has done in his home state of Pennsylvania as well as the Jersey shore. Locally, Ed has been commissioned to design and direct high school seniors in creating a community mural project in Pottstown, PA. The mural, to be titled, “Our Favorite Books,” will be on display directly behind the Pottstown Public library. Currently, in Shadybrook Farm, Bucks County, PA, a haunted attraction features aliens and other creatures designed and painted by Ed in 3-D day glow paint. “Alien Encounter” can be seen until Halloween 2007. Visit Map quest for directions to Shadybrook Farm. Ed exhibits locally: he mounted a Father's Day exhibit in Bause's Super Drug Store, Building a Better Boyertown office, and assorted exhibits sponsored by BBB's Arts and Activities Alliance. Ed has plans to run workshops in town to share his painting techniques with other lovers of art.